This is a jolly piece often requested. Rick tells me that the origins of this ditty is with Henry Clay Work’s 1865 song “Ring The Bell, Watchman“, and the melody and general air was quickly adopted by sailors as is so often the case. 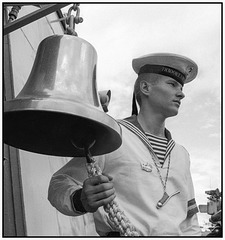 In this sailor’s form, Stan Hugill states that it was adapted to be a pumping chantey, and there are many variations of this such as “Click Go The Shears” and “Strike the Bell, Landlord.” At sea, the end of a watch was signaled when the ship’s bell was struck 8 times, which fell at midnight/noon, 8 (am/pm), and 4 (am/pm); the end of your watch meant that you could go below and try to get dry/warm/some sleep while the next watch took over on deck. 8 bells could also signify the metaphoric end of your watch in this life, meaning you had expired, but not in this case herein. And we wish that he would hurry up and strike, strike the bell. Oh we wish that you would hurry up and strike, strike the bell. And he’s wishin’ that the second mate would strike, strike the bell. He’s thinkin’ more of shortenin’ sail than strikin’ the bell.